While teaching viola is slightly different than teaching the other string instruments, it’s not more difficult. Below are a few suggestions for helping the school orchestra teacher develop violists, including recruitment ideas, technical assistance, and ways to fully engage violists in rehearsals – and your program. First, we must recruit violists. Many times, students are unfamiliar with the viola simply because it doesn’t live in the limelight as often as the violin, cello, or bass. However, recruiting the right student for the viola is important. Viola students must be drawn to the timbre of the instrument. If they do not like the way it sounds, they won’t want to practice it! Demonstrate on VIOLA! Let the students hear a mature viola tone to help draw in students to the instruments’ unique timbre. If a piano student expresses interest in joining orchestra, encourage them to consider the viola. Since that student knows how to read treble and bass clefs, the note reading application to the instrument will be the same for them as the other students as they learn a new clef, alto clef. You can start beginning violists! In fact, start lots of them! The viola instrument is made in smaller sizes, too. Encourage students who may develop an interest in switching to the viola to try it by offering a summer “Switchers” class or private instruction. Make sure the instrument is fitted for the student. I would encourage parents to rent since violas change sizes by inch (or partial inch), i.e. 15.5 inches and 16 ¼ inches. Check with your string instrument dealer to see what size increments they typically carry for violas. Do they move up by half inch or a quarter inch? You’ll also want to be aware of the rib height, or how tall the instrument is between the back and the top. The student needs to be comfortable with this measurement as well. Also, always make sure the tone is round and resonant from all strings. Technique considerations are where the instruction on the viola typically differs from other string instruments in the school orchestra. A few considerations are listed below. Regarding instrument set-up, using a shoulder rest is a must. Sponges do not provide the support that the size of the viola necessitates. As the student grows, the shoulder rest may need to be “built up” by adding extra layers to the vertical rise to help support the level of the viola as the neck has lengthened. The size and shape of the shoulder shelf will also affect the type and angle of the shoulder rest. Chin rest height and shape should be adjusted to fit each viola student. Make considerations for a center chin rest as the student gets closer to their adult sized instrument to balance the growing instrument body if necessary. The angle of the instrument can be slightly forward and slightly down. Typical violin placement, which can angle up and further to the left, can cause tension in the left arm AND it causes tension in the right arm as it is forced to reach across the body to place the bow on the string. Regarding left hand shape, the left arm must have more swing from right to left because of the need to reach back towards the C string and to maneuver around the upper bout when playing in position. To focus on the dexterity of the left hand fingers, focus on the “lift” of the finger. A player should be able to comfortably place fourth finger on the C string in 1st position and 3rd position. If this is not comfortable, then the viola may be too large for the student. Regarding pronation and supination of the bow hand, you’ll want to encourage students to use natural arm weight rather than applying pressure. You will find that many violists use more supination than pronation to achieve their desired tone. Therefore, there is minimal wrist motion and more rotary motion from the forearm. Encourage students to use full right arm weight. They should feel the hang of the right arm all the way from the lower back. Also encourage students to use a slower speed and heavier weight of the bow. Give feedback and instruction about adjusting the speed of the bow FIRST before addressing the weight. Most times, in doing so, the weight will correct itself. Stress the importance of bowing lanes as a factor towards achieving a greater palate of dynamics and tone colors; 5 at bridge, 1 at fingerboard. 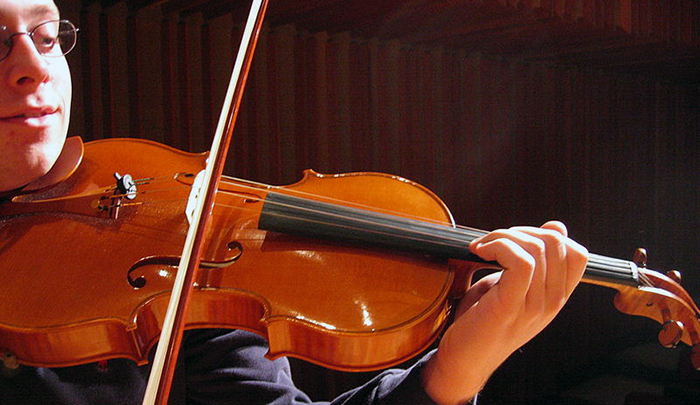 In general, violists focus much less of their performance in the upper half of the bow than their violin colleagues. Balance point and lower half playing allows greater control and contact with the string. Instead change the weight of the bow stroke and the lane placement of the bow. In the rehearsal, violists are the true mediator. “Sitting between the violins and cellos, and listening with great care to more than one musical line at a time, the violist enjoys a unique perspective on the music—and on the dissonance that can arise between players. As a result, violists often find themselves hearing both sides of an argument, then helping to bring it to a harmonious resolution…You’re the people person, the glue that holds things together” (Green, 2003, p. 142-143). Again, demonstrate and model on the viola allowing students to hear and mimic appropriate, strong viola tone. Have violists who need a music reading challenge perform their part from the Violin III part, increasing their treble clef music reading skills. Have the principal violist tune the orchestra (try rotating this responsibility to each section principal in the ensemble!). To achieve balance with the ensemble, have the violists turn their chairs out toward the audience so that more of their sound goes out into the audience instead of into the ensemble. Work to achieve bowings that not only fit the violin or cello line, but accommodate the viola as well. Include students in the decision making process as they are able. Musically, the school orchestra violist may become less than excited about another piece for the ensemble that features predominately the violins and perhaps the cellos, while they, yet again, have the opportunity to play the chick, chick to the basses BOOM (which would also be boring for the school orchestra bassist…but that is another article). Of course, performing that role in the ensemble is important as well, but a variety of pieces should be performed so that each section has the chance to perform melodic and harmonic lines. Bring in artist violists to perform with your orchestras or demonstrate for your classes or just the violists! Know who national and international artist violists are. Provide videos and websites to your students. Program repertoire that features challenging yet approachable parts for violists. Include repertoire that contains notes on the G and C strings for violists, chromatic alterations, significant melody and harmony lines. Bob Gillespie and I co-wrote an article in August, 2013 for the American String Teacher entitled “Making a musical life for violists in school orchestra.” We polled string/orchestra teachers from around the country to gather their favorite pieces with prominent and high-quality viola parts. The article includes a list of 24 pieces for Elementary/1st and 2nd year players (grades .5 to 2), 57 pieces for Middle School/3rd and 4th year players (grades 2 to 4), and 28 pieces for High School/5th, 6th, and 7th years players (grades 2.5 to 5). See the reference list below. Feature the entire viola section in a concert. Use a variety of seating arrangements in the ensemble to allow other sections to hear the viola section (and others) in different ways. Have a Play-In! An afternoon where the violists comes and you play viola ensemble music. Search for a Viola Day that may be offered by your local college or university. These are fantastic outreach programs where young violists have the opportunity to meet other young violists and learn from viola teachers. Encourage students to attend music camp where specific time is focused on viola technique building and perhaps offers viola performance ensembles. Facilitate a mentor program from the high school to the middle school with viola mentors/mentees. Look into side-by-side opportunities with other school orchestras, semi-professional or regional orchestras, and collegiate orchestras (non-major ensembles or ensembles for majors). Encourage student violists to become members of Facebook pages for violists (American Viola Society, International Viola Society, and Young Violists’). Create special outreach projects or performances organized and led by violists. If you are not a violist, attend a summer teacher workshop or simply contact a viola teacher to take lessons on the instrument. Understanding the instrument comes from playing the instrument. Become involved with the American Viola Society and its state chapters. Additionally, read the books below by our viola forefathers, Lionel Tertis and William Primrose. Become a member of the Facebook pages listed above for violists and those for string and orchestra teachers (School Orchestra and String Teachers, Network of Positive Orchestra Directors, Asta America, and American String Teachers Association). The characteristics about violists that Barry Green discovered when writing his book on the traits of musicians in The Mastery of Music: Ten Pathways to True Artistry was that, besides being excellent performers, violists are leaders, organizers, and managers of tasks and individuals as well. These are traits for all 21st century citizens. Integrating some of the suggestions above may help your school orchestra violists to take on not only a more challenging performance task, but leadership, organizational, and managerial tasks that will help them to develop as violists and as citizens for a 21st century world! Blair Williams (PhD, The Ohio State University; MM, Kansas State University; BME, Baylor University) is the Assistant Professor of String Music Education at Texas Tech University. Her duties at Texas Tech include supervising string student teachers, teaching courses in string pedagogy, music education, and instrumental conducting, and directing the Texas Tech University String Project. She also serves as conductor for the Youth Orchestras of Lubbok. 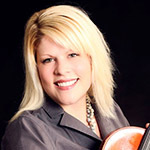 Dr. Williams began her string career as a violist and has been an advocate for student violists throughout her career. Dr. Williams thanks her viola teachers for instilling the love of the viola — Brian Wiebe, Kevin Monroe, Kay Buskirk, Kathryn Steely, Julia Hardie, Cora Cooper, Kristin Mortenson, and Juliet White-Smith. Barnes, G. (Ed.). (2005). Playing and teaching the viola. Fairfax, VA: American String Teachers Association. Barrett, H. (1972, 1978). The viola: Complete guide for teachers and students. Tuscaloosa, AL: University of Alabama Press. Butler, M. (2006). Which switch? Strad, 177(1394), 34-38. Dalton, D. and Starker, J. (1990). Playing the viola: Conversations with William Primrose. New York: Oxford University Press. Davis, L. (1978). The transition from violin to viola. The Instrumentalist, 33(1), 90. Fischer, S. (2010). Secrets of tone production [DVD]. London: Edition Peters. Gillespie, R. and Williams, B. (2013). Making a musical life for violists in school orchestra. American String Teacher, 63(3), 40-45. Green, B. (2003). The mastery of music: Ten pathways to true artistry. New York: Broadway Books. Menuhin, Y. and Primrose, W. (1991). Violin and viola. New York: Schirmer Books. Pounds, D. (2006). Viola for violinists: The conversion kit. Dallas, TX: American Viola Society. Primrose, W. (1978). Walk on the north side: Memoirs of a violist. Provo, UT: Brigham Young University Press. Riley, M. (1991, 1993). The history of the viola, 2 vols. Ann Arbor, MI: Braum-Brumfield. Scott, H.K. (2011). 6 ways to improve your viola tone production. Strings, 25(7), 25-26. Stuen-Walker, E. (1992). Viola column: Tone takes time. American Suzuki Journal, 20(2), 54. Tertis, L. (1953). Cinderella no more. London: Peter Nevill LTD.
Tertis, L. (1974, 1992). My viola and I. London: Paul Elek. (1974), London: Kahn and Averill Publishers (1992). White-Smith, J. (2000). From violin to viola: Making the switch a success. American String Teacher, 50(1), 56-61. Whistler, H. S. (1947). From violin to viola: A transitional method. Chicago: Rubank.